Becoming engaged to be married is similar to entering into a contract in as much as there is an offer and an acceptance. However, in the UK an engagement is not seen as legally binding as you cannot force someone to either stay engaged or proceed with a wedding ceremony. Verbal contractual terms and conditions may apply within an engagement, and in the UK the engagement ring is usually seen as a sign of “sealing the deal”. 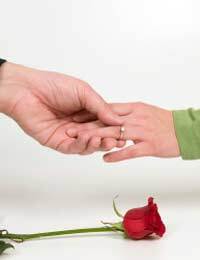 Traditionally, engagement contracts begin with the man offering a proposal of marriage, and if accepted by the woman then this will sometimes be known officially as betrothal. But with a multi-cultural society existing in Britain there are many different types of engagement traditions and rules. Many of these engagement traditions will be dependant on the rules governed by different religions. In the past, betrothal was an official agreement to marriage and was a formal contract that was blessed either by a city official or a religious figure. Today, betrothal contracts and agreements are rarely used except in some Jewish or Arab cultures. In the UK the exchange of engagement rings is traditionally seen as the agreement of betrothal but again it is not a legally binding contract. The acceptance of a proposal and the exchange of rings is seen as a promise to marry, and engagement rings are part and parcel of the “engagement contract”. The giving of engagement rings is thought to date back to the Roman era and the rings are regarded as a symbol of commitment between the two parties. In most cases the man will buy the engagement rings and present them to the woman as part of the marriage proposal. However, it is not uncommon today for the woman to buy the engagement rings. The offer of marriage can be rejected by the woman if she refuses to accept the engagement ring, or simply says no to the wedding proposal. In some countries an engagement ring is seen as a conditional gift and must be returned if the engagement is broken. There have been legal cases where men have actually sued their intended marriage partners when the ring was not returned after the engagement was broken. In Britain, if the man ends the engagement then the woman is usually entitled to keep the engagement ring. If the woman breaks the engagement then the man is legally entitled to the return of the ring. However if the ring was offered as part of a gift, for example on Christmas day or Valentines day then it will be seen as a gift and does not need to be returned. Each case is different and it will usually be left to the couple to decide who keeps the engagement ring. The engagement ring is usually seen as an unconditional gift in the UK. Public announcements are another way of officially announcing engagement contracts. These can either be placed in newspapers or a simple engagement party can be held to announce the wedding plans. Announcements in church are known as the banns of marriage. Historically the banns were used as a way of not only announcing marriage intentions but of allowing any objections to be raised regarding the marriage plans. The reading of the marriage banns is a formal act and in some cases a marriage will only be legally valid if a reading of the banns has taken place or the intended couple have obtained a marriage licence. In the strict legal sense of the word “contract”, engagement contracts are more a state of mind and are not legally binding contracts. They are a sign of intention, and an act of love and commitment towards two people. However, no part of the engagement agreement can be enforced by a court of law.